Shane Bettencourt (left) of East Providence with the 27 pound striped bass he caught off Prudence Island using live menhaden. His grandfather Albert Bettencourt (right) landed a 25 pound striped bass that same day. Caption Chuck Daignault, a charter captain from New York, caught his first ever keeper striped bass on Narragansett Bay this past weekend using a bubblegum colored tube with worm. 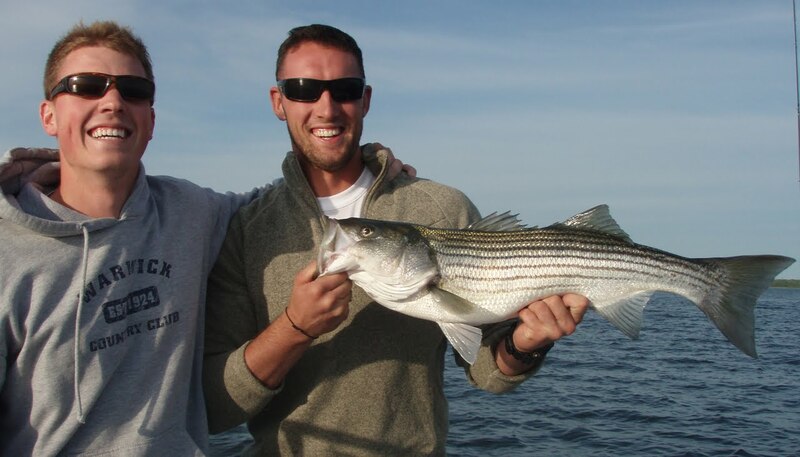 Kristian Dzilenski , holding fish, and Brendan McLaughlin, both of Warwick, with the striped bass they caught while fishing between Patience and Prudence Island on the north end. Kristian (USMC) was on his first fishing outing after returning from Afghanistan. Striped bass fishing opened up this week after heavy rains. More and more fish being caught and they are getting larger. Kevin Bettencourt of East Providence fished with his father and son Shane last week with great results landing a 25 and a 27 pound striped bass. Here is Kevin’s account of their trip. “We managed to sneak out... conditions were excellent. Pogies are still available in the Providence River. After snagging a dozen we headed South to fish around Prudence Island (Providence Point) where we landed several nice bass in the 32 - 35" inch range. Just before heading home my son Shane landed a beautiful 27 pounder. Shane is no stranger to big bass. He is proudly carrying on the Bettencourt tradition. 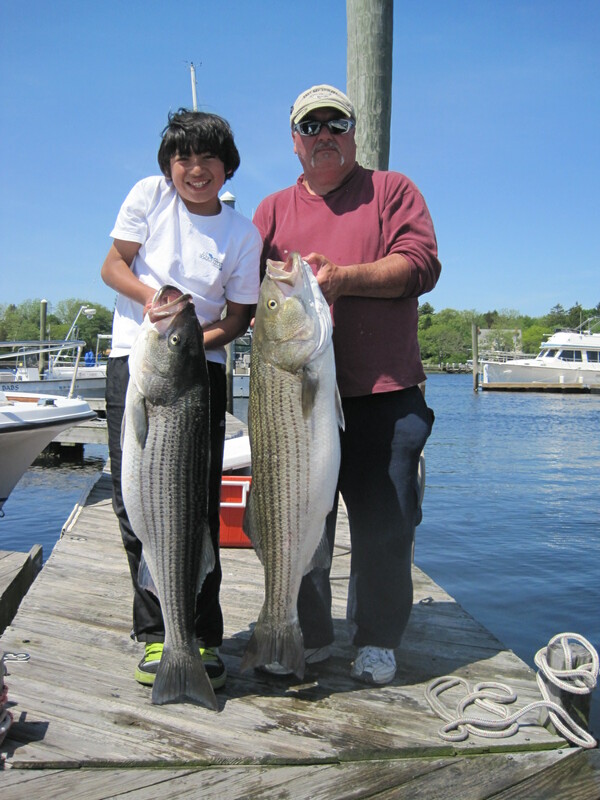 Three years ago he landed a 42 pounder in Newport and roughly five years ago he won the Striper Marina Tournament (Jr. Division) with a 22 pounder… not too shabby for 11 years old. Merrill True fished the upper Bay in the East Passage using chunks and live menhaden last week. He fished around the white cone off East Providence and the west shore in early afternoon and had a double hoop up of bass while chucking menhaden in low water. With the 2012 saltwater fishing season underway, the Department of Environmental Management reminds anglers and spear fishers that a 2012 saltwater fishing license is needed to fish recreationally in all marine waters. Obtaining a license is easy. Just go to www.saltwater.ri.gov. Have a driver's license or state identification card handy, as well as your date of birth, address, and phone number. For Rhode Island residents over 65 and for active military personnel stationed in the state, licenses are free, but still required. Children under 16 years old do not need a license. For all others, the $7 fee ($10 for non-residents) is payable using a VISA, MasterCard or Discover card. Once the information is entered, you can immediately print your license and go fishing! Anglers and spear fishers also have the option of purchasing a license at participating bait and tackle shops and sporting good stores, using cash or a credit card. A list of participating vendors may be found on the www.saltwater.ri.gov website. 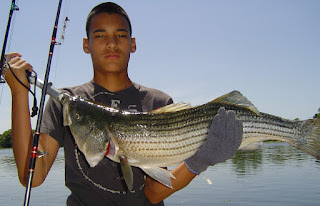 Blake Dobson with the 36” striped bass he caught on No Fluke Charters Saturday off Warwick Neck near Seminary Cove using tube and worm in 12’ of water. Bob Matteson, first mate on Captain Sheriff’s Fishing Charters, with a bass caught with parachute jigs on the Southwest side of Block Island. Captain Sheriff found fish in the mid 30 inch range this weekend at both the North Rip and the Southwest side of the Island. Kim Bissonnette of South County holds some of the fish he recently caught freshwater fishing as the season improves. 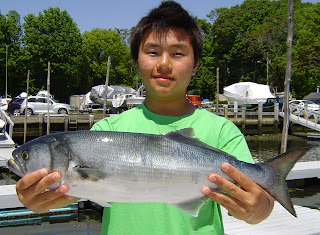 Mike Thao of Leominster, MA said “My family loves to eat bluefish.” as he held the bluefish he caught off Poppasquash Point, Bristol. I often ask myself what is it about fishing that drives me (and others) to fish. I always come back to the adventure of it all and the spirit of discovery. I reinvigorated my spirit for fishing this weekend thanks to Blake Dobson and Mike Thao of Leominster, Massachusetts (two fourteen year old boys). 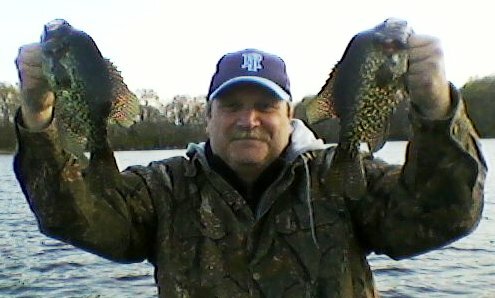 I took them and Blake’s grandfather Doug fishing Saturday. We worked hard for all bites. I spoke to Blake three or four times before our trip. He always had questions. He was all about fishing. What are we using for bait? Do you ever use buck tails? Where will we fish? And many, many more questions. Not losing faith… the belief that they were going to catch fish and the spirit of discovery drove them to find the fish. We continued to chuck with menhaden, fish with clams, tube and worm, live line menhaden until finally, through hard work and persistence, their faith paid off. Blake landed a 36” striped bass in 12 feet of water between Seminary Cove and Warwick Neck Light as we trolled the low water close to shore. Blake said, “Thank you for finding the fish, I feel great.” And, once again my fishing sprit was renewed... this time by these two fourteen year olds. The West Bay Anglers William Beaudrey Jr. Memorial Striper Tournament will take place from 12:01 a.m. on June 2nd thru 10:00 a.m., June 10th. Cash prizes include $500 for the first place overall largest fish, $200 each for the second place man or woman, $100 each for third place man or woman. Prizes to be awarded at the Warwick FOP at 95 Tanner Avenue, Warwick at 1:00 p.m. on June 10, 2012. Entry fee is $25 per angler; you must register by 5:00 p.m., June 1st. Applications can be picked up at Erickson Brothers, John’s Bait, Lucky's Bait and Tackle, Ray’s Bait and the Tackle Box. On May 15, 2012 the Rhode Island Department of Environmental Management (DEM) opened the commercial bait fishery for Atlantic Menhaden in the Narragansett Bay Menhaden Management Area. Menhaden boats worked the Bay last week for the fists time this season. They may not fish north of Conimicut Light nor are they allowed to fish in western Greenwich Bay. DEM performs aerial surveys by helicopter and airplane each week counting the number of schools to estimate biomass. When the number of fish drops to threshold limits, fishing is suspended. This monitoring program is a model fisheries management program being studied by others throughout the country. We should be very proud of it. Trout fishing in ponds stocked by DEM has been good too. Visit http://www.dem.ri.gov/ for a complete listing of ponds and lakes that have been stocked. Captain John Rainone (left) of L’il Toot Charters, Point Judith is inspected by Captain Nick Butziger, Commander of the North Star Flotilla of the U.S. Coast Guard Auxiliary. A volunteer program to provide examination stickers for Uninspected Passenger Vessels (UPV) started in August, 2011. Captain Arnold (Nick) Butziger has been involved with boating safety just about all his adult life. He is the Commander of the North Star Flotilla of the U.S. Coast Guard Auxiliary and has organized and taught boating safety programs for Rhode Islanders since the early 70’s. However, for the past several years Captain Butziger has turned his attention to a new program. A program that he and a few colleagues started in August, 2011 for Coast Guard sector “Southeast New England”. It is the first of its type from Maine to New Jersey. It is a program that aims to provide examinations and examination stickers to for-hire Uninspected Passenger Vessels (UPV). Uninspected Passenger Vessels (UPV) are commercial vessels allowed to carry one to no more than six passengers for-hire. Charter fishing boats and sailing characters are examples of Uninspected Passenger Vessels. Inspected vessels are commercial vessels allowed to carry over six passengers for-hire. These vessels are required to be inspected by the Coast Guard. Examples are tour boats and party fishing boats that carry a large number of anglers (over six passengers). I asked Captain Butziger why he has dedicated so much of his life to boating safety and how the new UPV examinations work. Here is what he had to say. Why should consumers care about vessels that have received UPV Examination stickers? The sticker demonstrates to consumers in the for-hire or charter industry that the owner of the vessel took the time to be inspected, validating that his/her vessel met all requirements. Captain Butziger said, “The examination and sticker benefits the vessel owners/captains too, in that they can make the claim that their vessel has been inspected by a qualified examiner and meets all Federal Regulations. The sticker is good for two years.” said Captain Butziger. Consumers should care about vessels that have UPV stickers because the sticker means the vessel (such as charter fishing vessel you hire to take you fishing) has been inspected by the Coast Guard (or more than likely by the Coast Guard Auxiliary) and meets all specific regulations contained in the Code of Federal Regulation pertaining to such vessels. Boats without the sticker have to meet the same regulations, however, the sticker means that the vessel has been inspected and that at the time of inspection the vessel was in compliance with regulations. Who is issuing UPV examinations/stickers? Captain Nick Butziger said, “We now have six certified examiners with twenty additional now being trained.” The need is growing quickly. “There are over 500 vessels that can potentially be inspected in the Coast Guard Sector “Southeast New England.”, said Butziger. What types of items are examined during inspection? As noted above, all Unexpected Passenger Vessels must meet regulations contained in the Code of Federal Regulations pertaining to such vessels. Items include proper type I life jackets for all passengers, appropriated fire safety equipment and extinguishers, safety equipment such as flares, whistles and/or horns, captain and crew certifications, proper licenses, participation in a random drug testing program as well as a host of other inspection items. Each UPV examination takes about two hours. For a detailed list of requirements and for more information about the UPV examination program visit www.NorthStarFlotilla.com and click on UPV. Tautog fishing is fair. Mary Dangelo of Maridee Canvass Bait & Tackle said, “Customers caught some nice tautog off Black Point Narragansett this week.” Ken Landry of Ray’s Bait & Tackle said anglers are catching tautog if the upper reaches of the Providence River around the bulkheads and piers. Fluke (summer flounder) fishing is slow. Few anglers are targeting fluke at this time. Those fishing Warwick Neck, Austin Hollow and the bridge areas are catching very few keepers at this time. Janice Masco with a Francis Fleet mate and the fluke she caught during a past VIP Fishing Tournament. The RI Lion’s Sight Foundation has sponsored the tournament for five years. It is designed for visually impaired persons (VIP) and is June 24 this year. These reports have been pouring in. 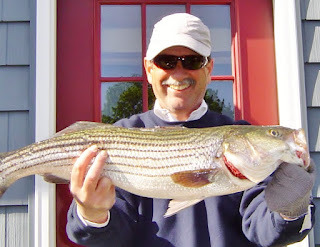 Take advantage of the great striped bass bite. Here are ten ways to catch them. 1. Chunking fresh or frozen menhaden. You can anchor (and chum); drift fish or fish the moving bait pods with chunks. Some anglers use a weight slide to get the bait down. 2. Live menhaden. Find a school and snag live menhaden with a weighted treble hook or net them. Hook the bait through the back or bridge of the nose and put the live menhaden back into the school. 3. Surface plugs or poppers. Great way to catch school bass in the spring. 4. Swimming lures. My favorite this spring is a grey Yozuri Crystal Minnow. 5. Parachute squid jigs. Often used in ocean water (or where there are squid). Anglers successfully use this method off Newport, Narragansett and Block Island. 6. Trolling with tube and worm. The idea is to get the bait down to the bottom where the big fish are. Use lead line in Bay and wire offshore in deeper water. Place a fresh clam worm on the hook. Use different colored tubes until you find one that works. Bubble gum colored tubes seem to work in spring in the Bay, amber tubes when fishing the southwest side of Block Island. 7. Trolling with umbrella rigs. Technique often used to troll off Block Island, in deeper parts of Narragansett Bay, off coastal shores with a variety of squid, shad and sand eel baits. 8. Casting soft plastics. Many anglers love this technique and use it successfully in the spring. Make sure the plastic baits are scented if not add some scent. 9. Buck tail jigs with pork rind squid strips. Have had success with this method to get under schools of blue fish and to the striped bass on the bottom. 10. Live eels. Used by shore and boat anglers, some fishing guides use this as their primary method to catch trophy stripers. Hook the eel through the mouth and out one eye. According to local news reports, Timothy Coleman, a well known fishing columnist, book author and fisherman was found dead last Thursday on the “sand trail” in Weekapaug area of Westerly, RI. He was found near an inland pond with his fishing gear. His death did not appear suspicious. Coleman, 65, wrote a weekly saltwater fishing column for The Day newspaper for ten years and had been managing editor for The Fisherman magazine’s New England edition from 1974 to 2001. 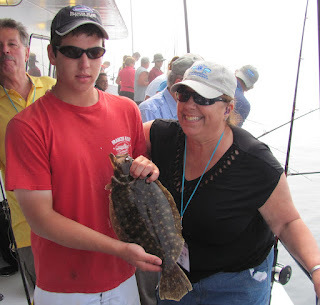 The RI Lions Sight Foundation (RILSF) will be hosting its 5th Annual VIP Fishing Tournament for Visually Impaired Persons (VIP) of RI on June 24, 2012. The half-day Tournament will be held on the Francis Fleet out of Galilee, RI. Participants will compete for trophies and the opportunity to represent Rhode Island at the Lions National VIP Tourney on the Outer Banks of North Carolina in October. The event is free of charge and includes transportation and guides if needed, gifts, breakfast and a morning of fluke fishing. Participants must be legally blind, at least 17 years of age and physically able to fish from a party boat. Applications for the tournament can be found at www.rilions.com or contact Ken Barthelemy, tournament chair, at 401.529.6673 or kenbar123@aol.com. Freshwater fishing for trout and bass remains very strong. “Anglers continue to catch trout as some of the ponds as they have already been restocked by DEM.”, said Dave Henault of Ocean State Tackle, Providence. Visit www.dem.ri.gov for a list of stocked ponds. Tautog. Elisa Martin of Snug Harbor Marina, South Kingstown, said, “Customer George Latos caught a 9 and a 10.4 pound tautog along the southern shore.” Customers of Quaker Lane Outfitters weighed in tautog from eight to ten pound this week said Steve McKenna. 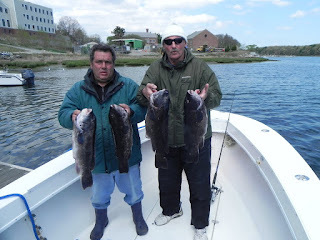 “Anglers fishing off the Wharf Tavern and the Barrington bridge are catching a lot of tautog. About one in ten fish have been keepers.” said John Littlefield of Archie’s Bait and Tackle, Riverside. He said the bite has been excellent at Conimicut Light and fair at Ohio Ledge. Striped bass. Elisa Martin from Snug Harbor said, “Bass anglers continue to catch small fish off the west wall at the Harbor of Refuge but all are waiting for a few warm days for the worm hatch to really take hold in our ponds.” Steve McKenna noted shore angler, author and associate at Quaker Lane Outfitters said, “The fishing has been outstanding. I would rate the season as A- so far. Last Friday I caught a 20 lb bass at Matunuck.” Shore anglers have been catching bass using worms from Sabin Point to Bold Point, “32 to 37 inch fish are quite common with a lot of smaller school bass mixed in.”, said John Littlefield of Archie’s Bait & Tackle. “The bass have now worked their way up to Pawtucket.” said Dave Henault of Ocean State Tackle. The “String Beans” area under the power lines on the East Providence side remains hot for bass anglers. Squid fishing was soft last week with the cold front moving in. They are expected to return as things warm up. 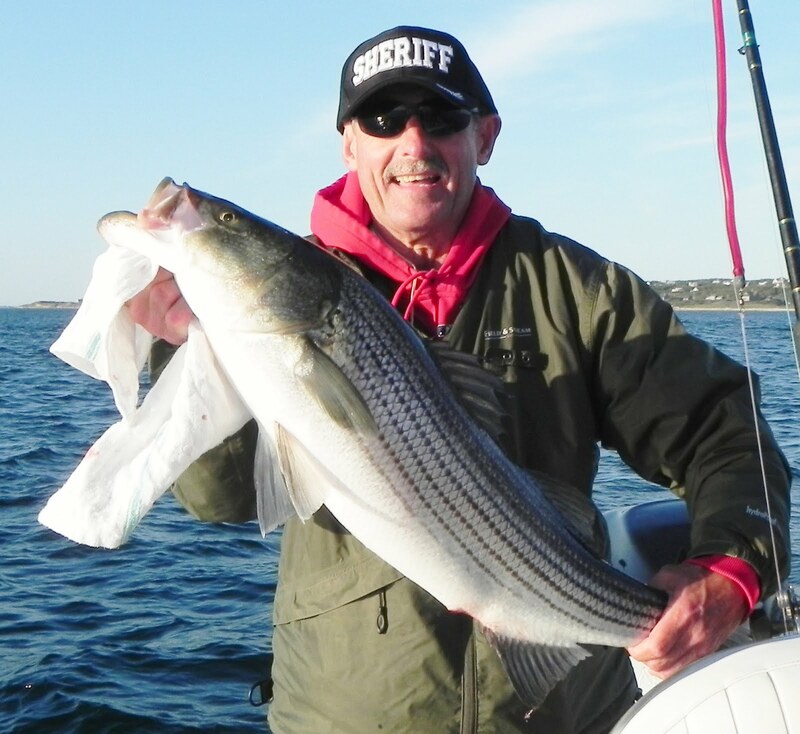 Captain Dave Monti holds the first striped bass of the season caught on No Fluke Charters last week in East Greenwich Cove. The fish was caught with a YoZuri Crystal Minnow swimming lure. Photo by Virginia Magnan-Monti. 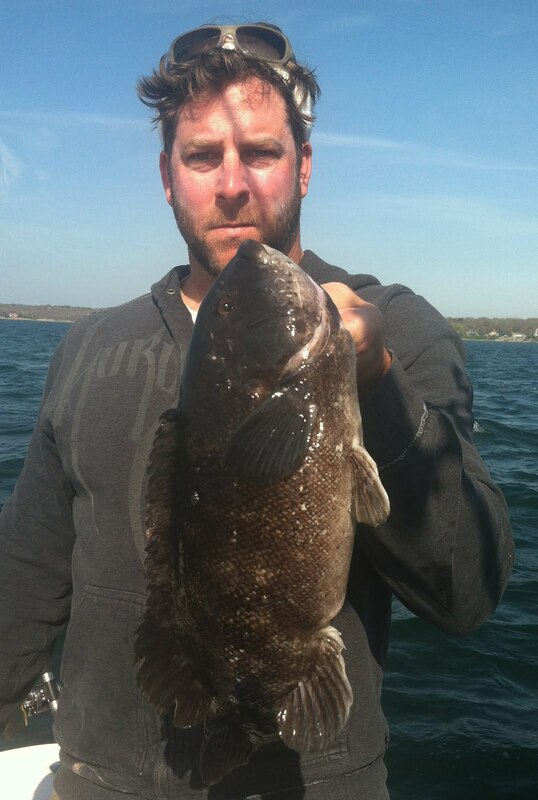 Captain Robb Roach with a Narragansett Bay tautog caught last week. Tautog fishing has been great in the Bay. Bob Matteson and Joe Amaral with Narragansett Bay tautog caught aboard Capt. Sheriff's Fishing Charters. 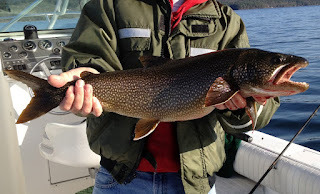 Frank Gionfrido of Narragansett, RI caught this nine pound, 28.5 inch lake trout jigging a Swedish pimple in 50 feet of water on Lake George, NY. 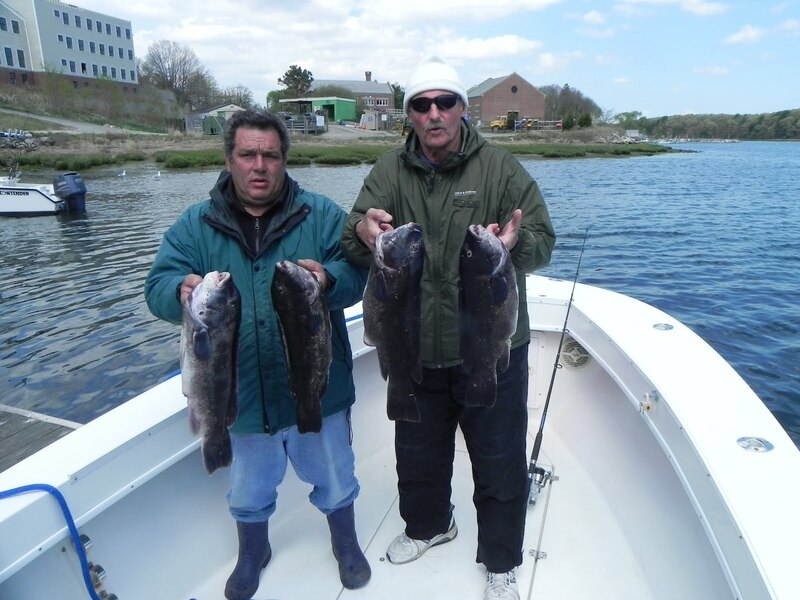 Spring tautog fishing which started two weeks ago has been outstanding. Tautog are going for Asian crabs and clam worms in a big way with anglers easily limiting out this week. 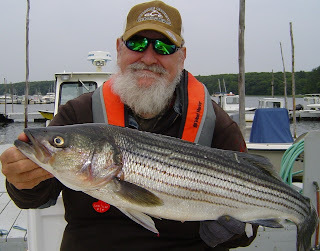 Fishing at most favorite Narragansett Bay spots has been good… Conimicut and Plum Point Light Houses, General Rock in North Kingstown, Hope Island and Coddington Cove. Also reports of nice fish taken off Point Judith and Narragansett. But before sharing some tips from the experts, here are 2012 regulations for tautog from the Rhode Island Department of Environmental Management (DEM). Tautog have to be sixteen inches or more. The catch limit for recreational anglers from April 15 through May 31 is three fish/person/day. The season is closed June 1 thru July 31 (during spawning) and reopens August 1 to October 14 with a three fish/person/day limit. The limit jumps to six fish/person/day on October 15 through December 15. However, there is a ten fish per boat limit during all periods. The boat limit does not apply to charter and party boats. Here is what the experts have to say about tautog fishing. Boat placement is important. Use electronics to find structure, estimate wind/drift direction and anchor up current from where you want to fish and drift back to the spot as the anchor is setting. Once in position, fish all sides of the boat casting a bit to cover as much area as you can. If still no bites, let some anchor line out a couple of times to change your position, if still no bites it is time to move the vessel. Fish lodged in structure. Here is a tip from George Poveromo’s “Rock’em Sock’em” article that appeared in a back issue of Saltwater magazine. When a fish is hooked and it has muscled its way back to structure, apply pressure forcing a respectable amount of bend in the rod. If the fish is not moving, hold the rod vertically to the water, tighten the line and pull or pluck the fishing line like a banjo string. The sharp vibrations emitted work their way back down to the fish through the line and irritate it. The fish, in a state of confusion, may back out of the hole to free itself from the irritation. Once you sense this has happened start reeling in the fish. If this does not work try letting the line just go limp for a minute or two. With no pressure on the fish, it may dislodge itself. The rig often frees itself, the fish may get unhooked, or you may still catch the fish. What type of bottom should you look for. From shore, look for rocky coastline like Beavertail Point on Jamestown, locations off Newport, Point Judith and off jetties at South County beaches. From a boat, I have had good luck at Plum Point light house next to the Jamestown Bridge, rock piles off Narragansett Beach, the jetty at Coddington Cove in Middletown, off Hope Island at rock piles and mussel beds on both the north and south sides, around Brenton Reef in Newport, Whale Rock, Ohio Ledge in the East Passage and any other places there is structure, debris, rock clusters, wrecks, etc. Freshwater. “Fishing is good for customers with nice sized rainbow trout being caught at Silver Spring Lake in North Kingstown and Beach Pond at Arcadia State Park.”, said Craig Castro of Erickson’s Bait & Tackle of Warwick, RI. Visit www.dem.ri.gov for a list of ponds, lakes and rivers stocked by DEM. Striped bass fishing is good. Bass to 38 inches being caught in the West passage with school bass being caught in covers, at the month of rivers and on the troll. Last week I caught my first keeper of the season in East Greenwich Cove. It was 29”, healthy with a medium sized girth for this time of year. All the fish this spring have been very aggressive. This one took a Yozuri Crystal Mino plastic swimming lure just before it was pulled out of the water. Dave Henault of Ocean State Tackle, Providence, reports a good bass bite in the Seekonk and Taunton Rivers. Customers catching bass on the troll up to the mouth of Omega Pond in East Providence. Jamestown Bridge near General Rock and Hope Island. (We) caught 17 keepers on Asian and Green crabs in 10 to 20 feet of water. 5.5 pounds was largest fish.” Captain Robb Roach experienced similar good luck last week in the East and West passage of the Bay (see above report). A 16 plus pound tautog was caught last week by Captain Billy Silvia of Can’t Imagine Charters, Bristol, RI. Squid fishing has been mixed this week. Captain Rick Bellavance said, “We are exploring squid fishing trips in the next week or two at a special rate”. Many anglers catch squid and freeze it for use as bait throughout the season. You can reach Captain Bellavance at www.priorityfishingcharters.com . Francis Fleet and Seven B’s vessels out of Galilee, RI are also taking anglers fishing for squid.